It has not been a great week for Orthodox Jews. First Matisyahu cut off his beard sending a shockwave through the Jewish community at large. Now B&H, the mega camera store run by ultra-Orthodox Jews just off the Lincoln Tunnel, is getting sued for discrimination…again. Former employees Luis Santana and Carlos Marchand have filed a lawsuit against the company claiming to have been looked over for promotions because they are Hispanic. Big surprise. For a brief stint out of college, I worked at B&H. As a pro video salesman, I was one of the many elves who helped thousands of people live out their filmmaking dreams by selling them expensive gear. 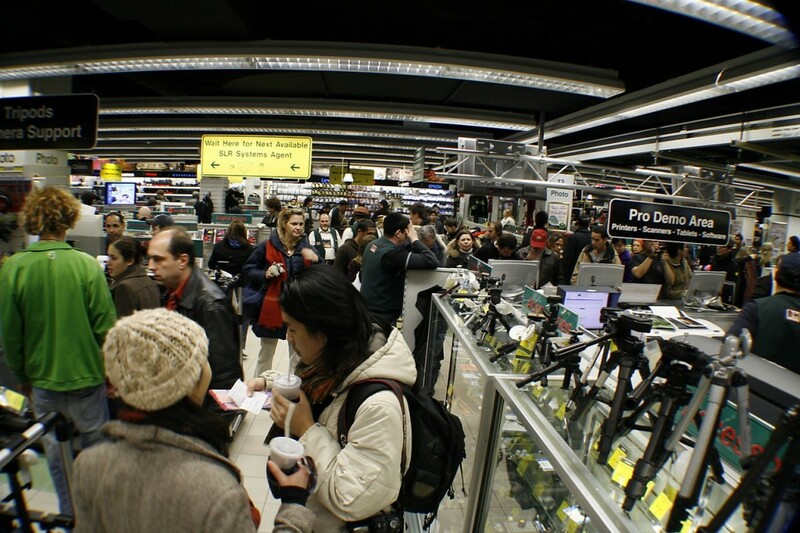 If you’ve never been to B&H’s store, it’s worth a visit if only to behold the sheer madness of it. While they’ve updated the store’s design since I left, the same basic shopping system remains. Instead of wandering through aisles to find a product that you like, you wait in line to speak with a salesman who will help you get what you need. After crunching a few keys on his keyboard, he tells the basement to send up your order, and whatever lens or camera or accessory you wanted appears either by an elevator or a conveyor belt. They scan your purchase, give you a sales ticket and send your wares back into the Rube Goldberg bowels of the store, where it will eventually lead back to the check out register. You pay, then you wait in line again to actually get your purchase. It feels more like an airport than an electronics store, with bloated signs pointing the way to whatever you need (Photography →, Lighting ↖, Audio ↘, etc.). It’s capitalist efficiency run amok, and it’s all part of what makes it one of the greatest camera stores in the world. In the lawsuit against B&H, filed in State Supreme Court in the Bronx, one current and three former female employees claim that they were denied sales positions because they are women. According to the lawsuit, this was a common practice at B&H. Nakisha Cushnie, the lead plaintiff in the case, was “advised that these positions were not open to her due to ‘religious reasons,’ ” the lawsuit says. And now two former hispanic employees are alleging that they were denied promotions because of their race. It comes as no surprise to me since I got to see how things worked on the inside. I worked with many great people at B&H, some of whom I still keep in touch with. The ultra-Orthodox employees were never anything but kind to me, and I always found them to be good company on the floor. But I was also acutely aware that a lot of my good fortune within B&H had to do with the fact that I was born a man and a Jew. I want to be clear that I have no smoking gun. I never witnessed a woman being denied a job or an hispanic worker opening a smaller paycheck than his Satmar colleague. My time there provided more anecdotal evidence of the cultural divide between peoples. For the Orthodox Satmar Jews that divide is by design, but the rest of us live in the real world and came to work in theirs at B&H, right down to the veritable mechitza, the partition that separates mens’ and womens’ seating in some Orthodox synagogues, that existed within the company. Many women worked there when I did, but they were usually out of sight. I don’t recall any women working on the floor in sales positions. Mostly, B&H, like many retail operations, was a demoralizing place to work. It’s a megalith that does billions of dollars with of business a year that runs like a well-oiled machine, literally. As baskets of merchandise zip along the ceiling of the store it’s easy to feel like you’re just another cog in the business, like some dutiful worker in Fritz Lang’s Metropolis. Press the buttons, make the sale, fatten the company’s bottom line. That kind of environment breeds resentment from the start. Add into that mix a mostly homogenous staff with well-known but hushed barriers to success, and you are bound to make a lot of people angry. B&H shouldn’t view these lawsuits as a thorn in their paw or a nuisance that will lighten their coffers. Instead they should grab the opportunity to change their ways and harness the pool of motivated people who want to work there. There are a lot of women, Hispanics and non-Jews itching to sell cameras. Why not put them to good use instead of holding them back? These lawsuits will keep on coming until, as an entity, B&H cleans up its act. As a Jew, I am proud to see that our people have built one of the most formidable retail outlets on the planet. Also as a Jew it pains me to see that the practice of treating employees differently along the lines of race, gender and religion still continues. We fought to break down those barriers elsewhere, it’s time to clean up our own house. B&H, make this right. Photo by NYCArthur on Flickr. I live in Crown Heights Brooklyn, I know a thing or two about discrimination between the Black community and the Orthodox community. I worked in B&H for one day and I noticed the clear line of division. I remember the lunch rooms and the huge difference. The men’s room was a good size with tables and a snack machine meanwhile the females’ had two square tables and it was a size of a closet. I remember a young black greeter telling me that if anybody asked me that I was to say that B&H was a great work place and that they treated everyone fairly. I questioned this because I was only going to work there for one day but she was adamant that I’d do it if necessary. I also remember when I was signing out of work and the guy yelled at me accusing me of stealing time and I explained to him that the pen was dead in which his co-worker next to him apologized and threw out the pen. I knew then and there that I could not work there. I was offered a part time job through the company and I respectfully declined. I don’t wish that the company fails, but I do wish that they are taught tolerance, respect, and courtesy. This will probably only happen after the 14th lawsuit though. What a load of crap….Jews on Jews… BandH Photo offers advice, prices and integrity in what can be a hustler business. No one gets screwed….I am not a fan of Hasidim, but, you know to get to known them, they are people too….the young kids are trapped in their lifestyle that is deleterious to their eventual well being. At least BandH hires them, and many gentiles,white, non white and female work there…..Heeb Magazine is part of that self hating Hebrew I guss. I generally don’t like the idea of “discrimination”. And as a former member of the Orthodox community, I’ve seen bad behavior and bad attitudes. Yet, I have problems faulting a business like B and H for favoring “its own”. Why? Drop by most any other retail shop in the metro area. You’ll see few Orthodox Jews. Retail’s biggest day is Saturday…Shabbat. The few places where you can observe Shabbat and work in retail is in a Shomer Shabbat shop, like B and H. Corporate life, with an expectation of 24/7 availability, is no picnic either. If B and H hires on a non-discriminatory basis, thus reducing the number of opportunities for Shomrei Shabbat, will new opportunities open up for them in other establishments? I can’t get around the fact that an employer cannot hire whom it wants, when it wants. Noone is forced to work at an establishment. All Jews is ok with me, as are all blacks, all hispanics. etc. Ever visit an authentic Mexican restaurant or a Chinese Buffet, etc. Where are the non- Mexicans, or the non-Chinese? This is all Bullsh-t that our government is enforcing on a case by case basis where ever the complainers have an Ax to grind. Hire whom you want, fire whom you want, this used to be a free country..